This time of year, there is never any shortage of birds in my yard. Blue Jays, Robins, Cardinals, Bluebirds, Woodpeckers. This morning, I watched as a bird took flight from a Pine to an Oak and settle in the Poplar tree right beside my patio. As it swooped from one tree to the next, I saw what distinguished it: little white marks on the feathers. It was a Mockingbird. Blue Jays look like they’re dressed in some kind of old-fashioned royal uniform with a pointy hat. Robins have a reddish brown breast. Cardinals – the males anyway, are such a true and glorious shade of red, it sometimes takes my breath away when I see one. 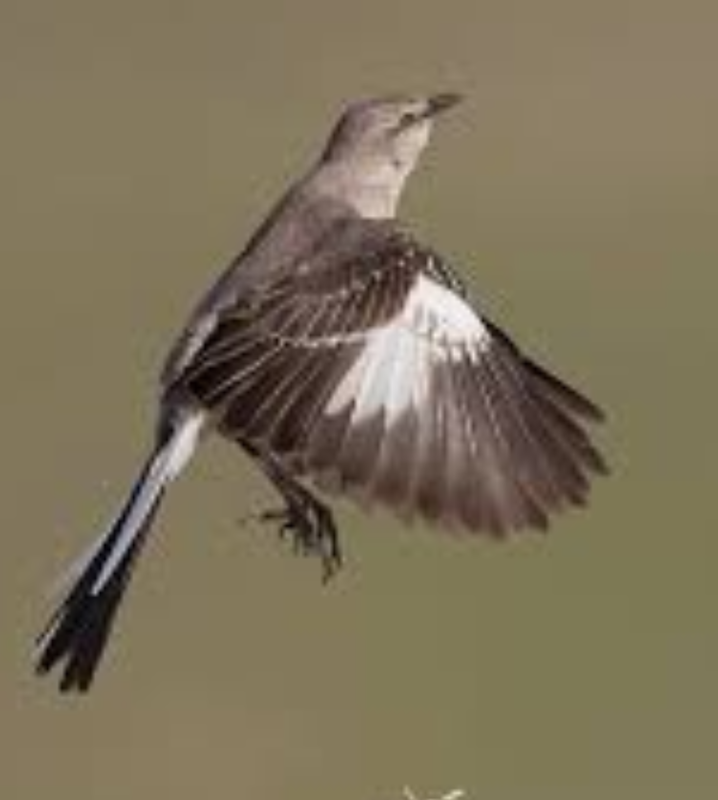 I used to only be able to recognize a Mockingbird when it was in flight. As soon I saw the white markings, I knew. Identity established. Harper Lee and her character Atticus, immortalized Mockingbirds through a best-selling novel. But based on my observations, they are not a creature to be romanticized. They are aggressive little creatures and will dive bomb you from the treetops if they perceive that you are a threat. They use their outer markings on their wings as an intimidation to other birds, and I’ve seen them scare away anything that even looks like it might disrupt their sanctuary. They are intelligent, clever creatures. They know what sets them apart in their world and they use those things to benefit them. So, over the years, I’ve gotten to where I can identify a Mockingbird, even from a distance. Because of its behavior. All of us have unique “markings”. Personality traits, past experiences that have made us who we are. We are given talents to use both for our own benefit, and to benefit others. But oftentimes those parts of ourselves are masked. People only see us and recognize us when we are “in flight”, i.e. at our best. What if we were so authentically ourselves, that people knew, immediately, who we are when they saw us? In an increasingly “virtual” society, where people seem to interact more online than they do in person, it’s easy to create the persona that you wish people to believe is you. Some people only seem to post pictures of fabulous vacations, loving moments with their families, inspirational thoughts. I’m certainly a fan of keeping things positive, as much as possible. God knows there’s enough negativity in the world without adding to it. But what if part of who you are is like a Mockingbird. What if you have an intimidating side? An aggressive side? Should you hide it? It’s part of what make you…you! Jesus invited his disciples to observe nature. Of the birds, he indicated that we should be more like them. They don’t worry. They just are. They just do what comes most naturally to them, and God takes care of them. There is beautiful simplicity in that. Just be who we are, using the things that set us apart for our benefit, and the benefit of others, not worrying about how we are perceived. Not worrying about being misunderstood. A Mockingbird has no evil intentions. It will fight you, but only if provoked or if it feels threatened. And, science even says that Mockingbirds remember. If you threatened it once, it can recognize you again. I think there’s a lesson there also. While humans are capable of forgiveness, we also remember. And sometimes we need to. Sometimes, we need to recall those who are threats to us, and keep them at a distance. I guess, all in all, I have a healthy respect for Mockingbirds. They know how to use their uniqueness, they aren’t afraid of protecting themselves and their own, and they are confident creatures. As a Christian, I believe that I am set apart. Not better than someone else. Set apart. I believe that the God that designed these interesting and unique animals in nature goes into even greater detail when it comes to the makeup of his created children. The one thing in nature that He created in his own image. I believe he gave me talents not like yours, and gave you talents not like mine. So that we could compliment each other. Learn more about the one who created us by recognizing those different “markings”. I believe he gave me common sense to perceive threats to my physical, spiritual, and mental well being. And the older I get, the less I am afraid to protect myself. I establish an invisible barrier around me and only dive bomb when necessary. I believe that He gave me the ability to sing the song that needs to be sung in the moment, like a Mockingbird can adjust it’s music to blend in with its surroundings. The Mockingbird is a survivalist. Not by trying to be something it’s not. But by being authentically true to its instincts. But there is a flip side to this analogy. We are capable of change. I certainly believe God desires to shape us into the image of his perfect Christ, but he does not begin with a blank slate. He begins with the unique creation that we are, and emphasizes our strengths, burns away our impurities. Phony people make me insane. Fake niceties aggravate me. Be who you are. In all of its good, bad, and ugly. God cannot work with plastic. We are His clay. We have imperfections. But he does not throw us away to change us. He lights a refining fire under us and as the heat rises, we become pliable, and he is able to perfect that which he created, that which we have allowed to become misshapen. Mockingbirds are who they are. Beautiful, clever, unique creations. So are we. But imagine what we would be if we allowed our Creator to perfect us, to highlight our unique “markings” in such a way that when people see us they would immediately know who, and Whose, we are. The legend says, “’tis a sin to kill a mockingbird.” Maybe because they have so much to teach us. I checked something off my bucket list yesterday. I have spent the last 23 years of my life in the south, and can honestly say I have a love for its history, good and bad. There is no culture that is proud of everything in its past, and the south is no exception. But there is almost always beauty to be found, if you know where to look. In Mississippi, that beauty is everywhere. In our landscape, our people, our oldest structures. And yesterday, with the family in tow, I set off to see some of it. Off of what must be one of the curviest, winding roads in the state, lies a treasure that, up until yesterday, I had only seen in pictures: The Windsor Ruins. And I have to say, pictures don’t even begin to do them justice. The columns are all that stand now, the house having burned in 1890. 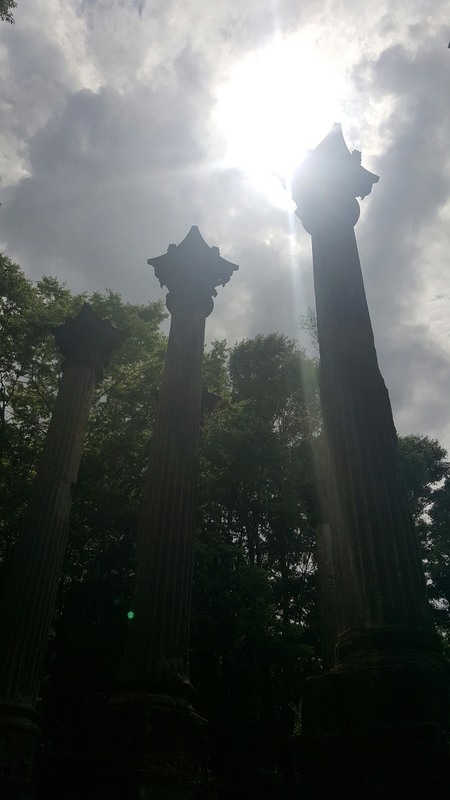 My husband and I have visited many antebellum homes over the years, and we were discussing yesterday how it seemed to be the ones that were unfinished, like Longwood in Natchez, or these lonely columns out in the woods near Port Gibson, that seemed to most spark imagination of what the world of our ancestors was like. Maybe because they’re unfinished. Maybe because there is no adornment to them: no Old Paris china, no paintings, or, in the case of Windsor, no walls. There is just what is, and what could have been. And it is that feeling, of knowing what is, and what could have been, that sums up what it feels like, for me anyway, being a southerner in a country where a lot of people don’t understand or appreciate my culture. Our first instinct when something is destroyed is to salvage what we can, and then to move beyond it. We are evolutionary creatures. We seem to feel the need to forget the past and leave it there. Sometimes we have to. Sometimes what happened was so traumatic or painful that we have to find a way to leave it behind. But sometimes, sometimes there is beauty there, in the Ruins. Sometimes we can take the winding road back to that place where it looks as though something was forever lost, and find that something remains. Columns, still adorned with detail and magnificence, reach toward the heavens, pointing our gaze higher than the destruction at ground level. So it is with our lives. Revisiting the Ruins can bring a new perspective, and can even inspire us with their raw, blemished beauty. There is a verse in Scripture that says God will give treasures found in secret places. Maybe this is what it means. Maybe it’s the secret places of our hearts where only we know the way. Maybe the treasure there is what is, what could have been. Maybe the treasure is what is still possible. At 34 years old, I am still discovering the hidden treasures of my state, but also my heart, my being. I recently made a decision to stop identifying with the work I have to do to support my family, and identify instead with the work that I do to become who I was meant to be. There have been unfinished places in my life, there have been fires that ravaged my heart, maybe even destroying parts of it for good, but there are treasures there. I am seeing some of them now for the first time, I am not digging through rubble, scavenging for something that isn’t there. I am standing in awe at what wasn’t burned away. I am embracing the beauty of my Ruins and turning my eyes upward. A few weeks ago, I was on my way home from work and realized I was extremely low on gas. I was almost to my house and didn’t feel like going back into town. I knew I had enough to get Reagan to school the next morning and there’s a gas station about 3 miles or less from the school, so I went home, parked, and forgot about it. By the time I got her to school the next day, I hit the button on the dash and the text glared back at me, “12 miles til empty”. I knew I was low, but seeing it there in glowing red letters, kinda brought home the urgency of the situation. I refilled the tank, and breathed easier the rest of the day. I am a busy person. And I only get busier with more obligations the older I get and the more involved my child becomes with her own life. Sometimes I don’t see just how low my own tank is getting until it becomes too obvious to ignore. About a month ago, I looked over the available vacation time I have and decided to take a few days near Memorial Day. A 5 day weekend. So here it is: Day 2 of my days off. I’m not at the beach or in the mountains or at Disney World. No, I am sitting on my patio. Listening to the birds, the breeze, my windchimes. I’m refilling my tank. I’m writing this post. I’m refilling my tank. I’m reading other blog posts. I’m having some quiet time. I’m going to spend the day with my family. I’m refilling my tank. Yesterday, I had the most wonderful conversation with someone that I am still getting to know and every time we talk,I love her more. She inspires me, encourages my writing and the goals I have for my creative side. It refilled my tank. This world, especially the “have tos” in life, will drain you of everything. Motivation, optimism, peace. I love that I am recognizing, more and more, the little things that refresh me. I recently started getting up about an hour earlier than I used to. I enjoy my solitude for a while before I go and give myself to my life for the day. It’s a daily refilling that I have come to realize is necessary for me to battle the demons of anxiety and stress that fatigue me. My mom is reading this book about decluttering one’s life. And basically, the object is to do your best to only surround yourself with things that bring you joy. Obviously we can’t control everything, but if I can have more of the activities in my life that refill my tank than drain it, well, the result is obvious, isn’t it? Joy. So much of life is about the choices we make. I used to stress about them all. Now, I don’t. I write. I get up early and drink in the sunrise. I dye my hair a fabulous shade of red. I wear shorts even though I’m not at my goal weight. I clean the house when I bloody well feel like it. I stay up for one more episode of our show with my daughter. I recently recognized and allowed to sink in, the very strong need I have for control. Over all kinds of things. It is unhealthy. It dictates my life in such a way that I feel miserable if I feel as though I’m not in control of more things than I am not. And so I’m learning a new balance. Learning that the “need to do” list is actually very different from what I thought. Yes, I have responsibilities. Even as I write this, there is housework that *needs* to be done. And I will get to it. Eventually. For now, I am choosing the thing that will refill my tank. The obligations, the responsibilities of life are always there, always will be. This day, this moment will not be. I am choosing to refill my tank for the next 4 days. It will be depleted within my first day back to work with a week full of “have tos”. I was 12 miles til empty on Wednesday. The needle is rising again. This blog is pretty public. It’s that way for a reason. I made the decision, years ago, that I was going to use my writing as a form of therapy. Putting my thoughts, feelings, and experiences in to words is a healing medium for me. Like exercise tones up my body, writing tones up my spirit. It gives me release, it allows me to explore the very depths of who I am, who I want to be. I used to play the piano. Used to. As the years have passed by, my ability in that area has diminished from lack of practice. I miss it. I think one day I will pick it up again, but for now, writing is my form of expression. I was talking to a dear friend this week, and she was telling me about this process she has been doing the last year or so. It’s been about releasing things, trapped feelings and emotions, and she looks and feels better than she has in decades. There is a joy in her that wasn’t there before. There is healing is letting go of certain parts of your own history. Owning it, then releasing it. My oldest niece graduated from high school last night. I get emotional at graduations, but not for the reason that most people do. Certainly I am nostalgic about how much she’s grown up and the beauty of that, but when I look at her, I remember what being that age feels like. I remember how much you think you know, but how much you really don’t. If you get to know me well enough, I’ll tell you my story. It doesn’t flow out of me easily sometimes, because there are parts of it that still haunt me. A lot. But as much as I write for me, I also write for people to read it. I put it out there in the great void of life and people tell me, “Your words touched me.” Sometimes people need to know that they’re not alone in how they feel, and that’s why I’m so transparent in what I say on this blog. When I was my niece’s age, I was a newlywed. At 16, I was accepted to college on early admission and a decent ACT score. I knew it all, I had nothing but self-confidence. So I bypassed my Senior year of high school and went straight to William Carey College. In that same year, I fell in love. I fell quite hard. Jason soon became my beginning and end of life and the most important thing to me. More important than family. More important than my faith. More important than myself, my goals, and my education. In January of 1999, I got pregnant. I was 16 years old. A kid. A very naive, stupid, careless kid. The fallout from my decisions would take years and years to repair. I lost the baby in the first trimester. I had quit school, so I got my GED and a got a job. The relationship with my parents was tense, to say the least. And after about 7 months of arguing and fighting and pushing until I got my way, I married Jason. I married him because I loved him. But I also married him to prove a point. To my parents: I am an adult and you can’t tell me what to do anymore. To myself: you didn’t make a mistake by getting pregnant. This will make it right. Justified. 4 years into our marriage, I got pregnant with Reagan. Jason and I struggled terribly both financially and emotionally throughout our marriage and when Reagan was born, the enormity of what true love really is hit me like an explosion. I only thought I had fallen in love before. When I laid eyes on my daughter for the first time, I knew, in an instant, that this, this was real, true, unconditional love. It was an awakening of sorts. Within a year of her birth, my marriage started crumbling from the very weak foundation upward. Shortly after Reagan’s first birthday, I made the most difficult request of my life and asked Jason for a divorce. We fought constantly. We had no direction, no common goals, and were not building the life, nor setting the example of family and marriage that I wanted for my daughter. When Reagan was 18 months old, her Dad and I split for good. It has taken me years, almost a decade, to own this part of my past. I have accepted it, lived with it, but I am my own harshest critic. I have struggled to forgive myself for the pain I caused my parents, for breaking the heart of the boy who was my first love and my best friend, for breaking up Reagan’s family before she even really knew what family was. I have had to forgive myself for the things I did to myself, also. For effectively ruining some well laid plans. I could have had a successful career in Psychology by now. A doctorate. A practice. It’s taken me years to accept what I did to ME. And some days, when I get home from a particularly hard day at my job, the feelings of guilt and regret will try to come seeping in. When I went back to college 5 years ago, it was for more than the degree. It was for closure. As much as it cost me both financially and emotionally, I went back to school because I felt the leading of the Holy Spirit to go. In those years at Belhaven, I found a healing. I remembered my potential. I remembered my ability. What Shey helped me believe about my outer beauty, Belhaven helped me believe about my mind. I was still capable. I was not a failure. Dreams can still become reality. And when I walked across the stage to accept my diploma, with the highest possible honors, something healed in my heart. When I watched my niece last night, I listened to the speeches given to that class about future possibilities. When I looked at those young faces, I wanted to tell them how many times some of them will fail before they succeed. I wanted to tell them that life may always come easy for them, but more than likely it won’t. That’s why you have to look for the healing places. What are the healing places? Well, my healing places are many. Nature, for one. I could sit on my patio for hours. When I was younger, I had a favorite tree by the creek that I would go to and sit in for hours. Listening, meditating. My healing place is my church, a place that I confess and worship and receieve the bread and wine and restoration for my soul. My healing place is in the embrace of my husband and daughter, in their eyes that look at me with understanding, hope, encouragement. My healing place is a friend, a quiet dinner or a on-the-go lunch conversation. My healing place is laughter with my sister or mom or dad. My healing place is here, on this blog, where I try to clumsily explain who I am and try to express through sharing my story that God is a true Redeemer. No, I am not mother of the year. I’m certainly not winning any good wife awards. I am about as low as I can be on the totem pole of my career. I’ve made some stupid decisions in my life. And tried to fix them with more, not-well-thought-out ideas. And if it were not for all my healing places, some of them would have broken me for good. Allie, honey, you’re gonna royally screw up sometimes. You’re going to be impetuous, you’re going to struggle with things you’d never thought you would. You’re going to have to work so hard, harder than you ever imagined. You’re going to realize that you don’t know as much as you think you do. You’re going to experience some deep heartbreak and some indescribable joy. You’re going to realize that success in life means something very different from diplomas and accomplishments. You’re going to go through some deep, deep valleys. But you will not walk alone. Never alone. There will be healing places all along the way. Stop at each one. Savor them. Drink them up. Feel their restoration deeply. You are being changed, from glory to glory, every day. Even in the darkest moments. You will not understand everything now, but one day you will. One day, you will reach the ultimate Healing Place. The one of which all of the ones in earthly life have given you a glimpse. All the old things will have passed away. All things will be new. Restored. Healed. For good. Isn’t it amazing? How, in one day, you can experience the breadth of life? Yesterday, I heard from a friend. A loved one has been battling cancer, and now it has returned. I’ve been in a position of watching someone I love battle the unknown. It’s scary. It’s unsettling. It’s the unknown because we don’t know what the outcome will be. I also spoke with a friend yesterday who is changing his life. In a few months, he’ll be off to a new city, learning something new, making a new life. It’s scary. It’s unsettling. It’s the unknown, because we don’t know what the outcome will be. There is hope for both situations. There is possibility in each. I can relate. I have been thinking a lot about possibilities lately. It takes some level of courage to go there in my mind, some level of faith, to see beyond the here and now. The facts in front of my face. Yes, possibly, I will one day own a condo on Navarre Beach. And yes, possibly, I might go bankrupt and spend the rest of my life in poverty. Each day is a possibility. As much as the Scripture seems to indicate that, with faith, all sorts of good things may happen, God is not a man, He is not predictable. So all things are possible. Good things, and, seemingly bad things. The place of faith that I find myself coming back to, again and again, is that because of this unpredictability, we need something in our life that is changeless. Eternal. Trustworthy. People are sometimes very unpredictable. I live with a tween and I cannot predict her mood from one day to the next. But I trust her. Because I know her at the core of who she is. I cannot predict my friend’s loved ones’ future. What the future test results will hold. Likewise, I cannot predict my other friend’s future. Whether he will succeed or fail. One depends a lot on science, medicine, attitude and faith. The other depends a lot on drive, determination, attitude and hard work. Both have possibilities. But here is where the two intersect: for one, a good attitude is essential for the positive outcome of both situations. Our mental state can make or break us. The other place where the two situations come together is a place of faith. While one is simply playing the hand they’ve been dealt and the other is actively trying to change their life, both require some semblance of faith. Of hope. Of embracing possibility. I have moved back and forth at times, thinking God really cares about the details of our lives, and sometimes thinking He must be more Creator than a Preservator. But I embrace the idea that He is both. I am open to the possibility. With God, all things are possible, after all. I think, wherever you find yourself in your life at this moment, it’s essential to remember the possibilities. The good and the bad. I think this is how God intends for us to view life: one possibility after another. I think it is in embracing the unpredictability that we come to know the changelessness of God’s nature. The unquenchenchlessness of his love. The limitlessness of his power. Possibilities are powerful. They have the ability to strike us with fear or hope, sometimes both. So as you embrace the possibilities before you today, remember that God is the author and finisher of our faith. He is full of possibility in and of Himself. There is no darkness in Him. There is nothing to truly fear when He is with you, and He is always with you. Embrace your possibilities today. Trust the Author. He writes no stories of defeat.